Katherine Paterson, author of Bridge to Terabitha, and husband John Paterson Sr. bring to life a ‘freely abridged’ version of Eden Phillpotts’ wonderful fantasy fairy tale, The Flint Heart, written in 1910. The story begins during the Stone Age when the flint stone was fashioned then discarded because of its ability to make the owner evil. It moves forward to a hundred years ago, to Dartmoor in England. The owner of Merripit Farm, Billy Jago, offers to help move some stones on a hill. As he digs at a grave with his son Charles, he unearths an unusual stone which he puts in his pocket. In no time, the flint has hardened Billy’s heart. He becomes cruel, abusive and violent to everyone he meets, but mostly to his family. Charles wants his father back; the kind loving one. He visits the Pixie’s Holt to get his father a present in the hope that he will return to who he was. It takes repeated trips into fairyland before Charles finally manages to take back and dispose of the flint heart. Immediately, life returns to normal. The flint heart passes through two other hands with the same result until the King of the pixies and fairies, finds a way to be rid of the flint heart forever. During the course of ownership, we meet many amazing characters that achieve great feats. But what stands out is the courage and philosophical approach of the children and the personified characters of Ship the dog, and Bismark, the hot water bottle, made in Germany. The tales of the flint heart’s ownerships are themes of power, ambition, and jealousy, and the negative outcomes that these emotions bring. Point of view is a pivotal issue, so there are many twists and turns and changes in perception throughout this multi-layered fairy story. Katherine, a former National Ambassador for Young People’s Literature, has won the Newbery Medal and the National Book Award, along with a string of other awards including the Hans Christian Andersen Medal for writing and the Astrid Lindgren Award for Lifetime Achievement. 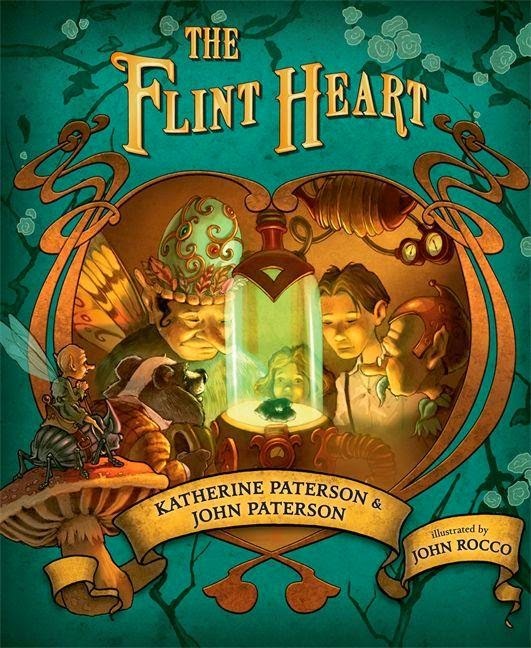 The Flint Heart, filled with adventure and fantasy, is ideal for the 7+ age group.